June is always a big month for Summer fairs and activities with many happening on the same day as each other. From experience when organising these things it is almost impossible to find a day that ticks every box including the "doesn't clash with any other activities" box. This Saturday sees the 20th Anniversary celebration of the Worcester Park Resident's Association. The WPRA was first formed in 1996 to fight the Somerfields supermarket being built where Waitrose now is in Stone Place. Whilst the WPRA didn't manage to get the development stopped, they certainly forced some conditions into the application. These included the building of a new Library (moved from across Windsor Road) with several computers for public use; a public meeting room on the first floor reached by a stair lift; a public toilet; limits on hours of deliveries to the supermarket for the benefit of nearby residents and also the free 2-hour parking which we continue to enjoy for the remaining car parking spaces today. Many community groups don't last nearly as long as this and ones that do often end up a mere shadow of their former selves. 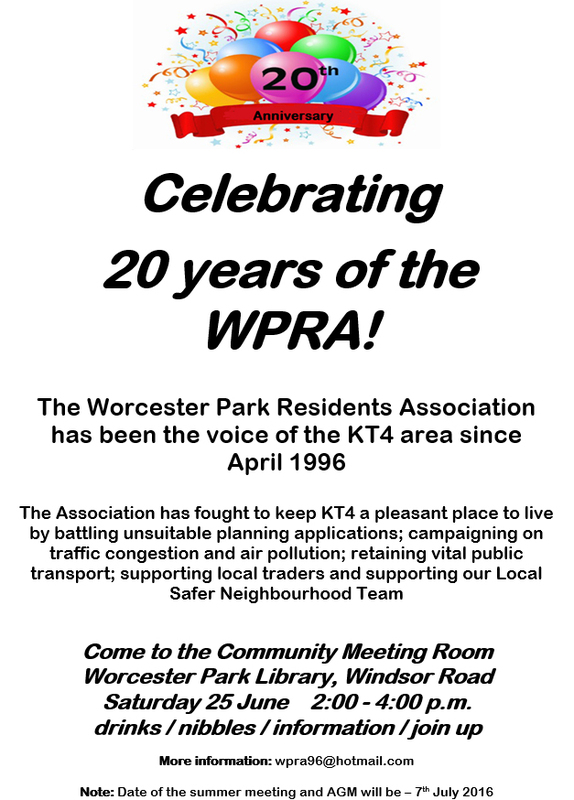 The WPRA has however gone from strength to strength and will be celebrating this astonishing milestone at Worcester Park Library next Saturday 25th June from 2-4pm. I will be there to help celebrate in my role as Chair of the organisation and I would invite everyone to come along and celebrate both the past and the future of the WPRA with us. There will be food and wine to enjoy (thanks to Waitrose for some sponsorship), a history of Worcester Park display focusing on the last 20 years and lots of good company!